Buffalo County Bucks offers first-class trophy whitetail deer and turkey hunting in Buffalo County, Wisconsin. Buffalo County Bucks is your answer to getting the trophy buck of a lifetime or a chance at a big Wisconsin Gobbler. Buffalo County, Wisconsin has produced more trophy whitetail deer than any other region in the WORLD! Located in the heart of Buffalo County, Wisconsin, you will hunt pre-scouted private land in or around the townships of Alma, Modena, Nelson and Waumandee. There are 8 different designated hunting locations, each with their own access point to minimize impact and pressure on the deer with a limited number of hunters allowed each season. Our clients measure our hunts by the entire experience, not by inches alone. Please join us for an excellent FREE RANGE TROPHY WHITETAIL HUNT. We offer modern metal ladder stands along with totally enclosed heated shelters to hide your scent and increase your hunting success. We offer deer hunting from mid-September through January of the year by bow, rifle and muzzleloader, depending on the regulations for any given year. Turkey hunting is also available in the spring and fall, depending on Wisconsin's hunting regulations. We also have experience catering to handicapped and elderly hunters, and can provide specially designed hunts for your needs. We offer modern-equipped cabins in the local area. We hope you can join us and we welcome the opportunity to make your hunting experience a memorable one with Buffalo County Bucks. For more information on available dates and price quotes go to the Buffalo County Buck's web site below. 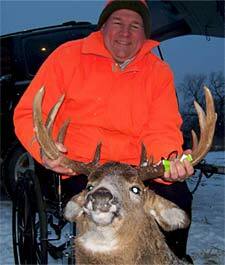 To book a hunt now call: 715-645-0865, 715-296-8690, 612-232-4528 or E mail.